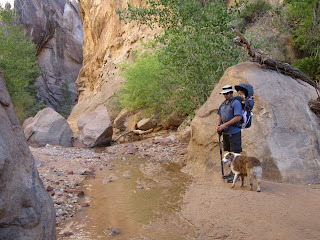 I completely forgot to post about hiking the Hackberry Canyon which penetrates into the Coxcomb along the Paria River. 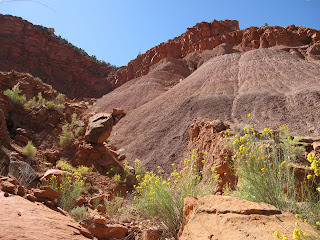 The Coxcomb is a fold in the earth that tilts the sedimentary layers up at a angle for some 30 miles along the Paria River and Cottonwood Wash. 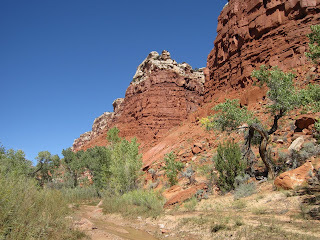 The way to reach Hackberry Canyon is to drive down US-89 from Kanab toward Page. 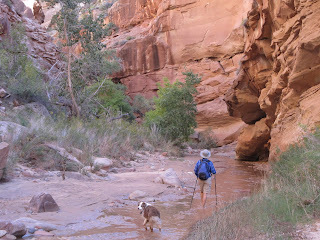 Shortly after crossing the Paria River look for a left onto Cottonwood Canyon Road. This rough dirt road goes for 46 miles up to Cannonville in Bryce Valley. Go 14.4 miles up Cottonwood Canyon road to reach the trailhead for Hackberry Canyon. 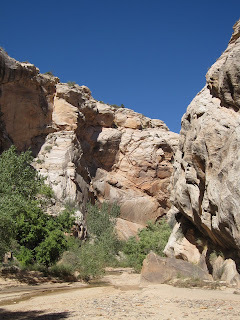 The trail starts off as a pleasant stroll through a sandy, cottonwood shaded wash. As the wash enters the canyon walls, the first signs of water begin to show on the surface. Soon, as the canyon walls close in, the creek grows larger and you will now need to criss-cross over the stream numerous times. 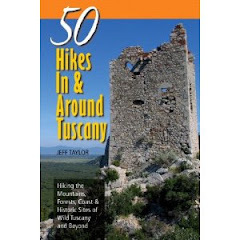 Most of the time, it is possible to skip over it, use rocks, or otherwise keep your feet dry. But, occassionally you may need to just step across through the shallow water. Also, watch out for quicksand. These piles of sand seem stable and dry until you step on them. Every movement causes water from below to move upward in a process known as liquifaction and you will sink deeper in. Usually you can step out before you sink ankle deep, but Linda ended up knee deep once. The route through this beautiful slot is just filled with amazing colors and sights. 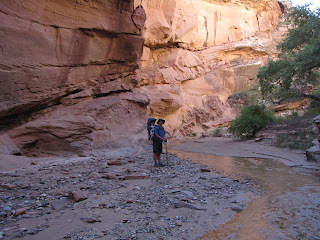 After about a mile, the creek leaves the narrow, white sandstone and enters a wider, sunnier red canyon of siltstone. This area has a completely different feel. 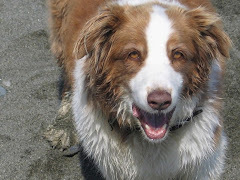 The stream is allowed to meander more, the vegetation is more arid adapted, and the cliffs a bright red. We hiked about 1 more mile up through this canyon. 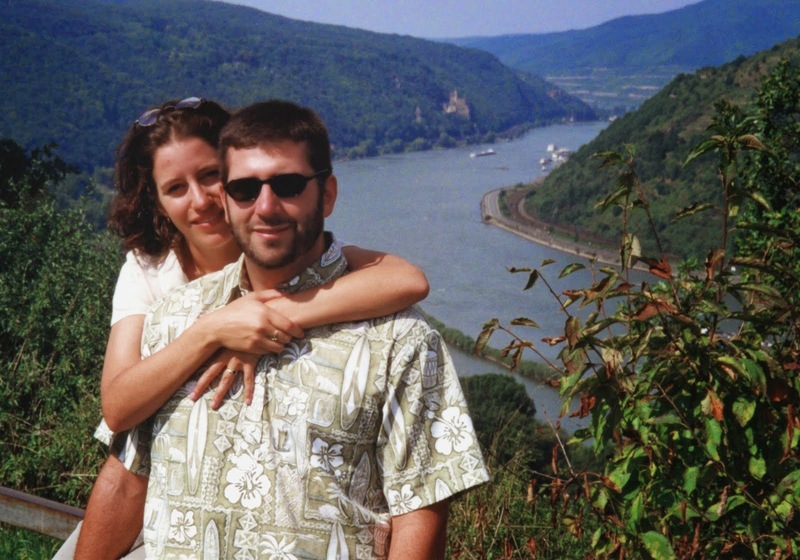 Eventually, we decided that it was not going to change significantly the further we went and it was getting hot. However, I read the entire length of the canyon is 20 miles and end up meeting up with the road further up. So, it is possible, by backpacking, to go the length of it, especially if you had another car to park at the exit.